It is one of a number of elegant—and expensive—mechanical solutions China is turning to as it faces an ageing population, which, even in the world's most populous country, is making workers harder to come by. 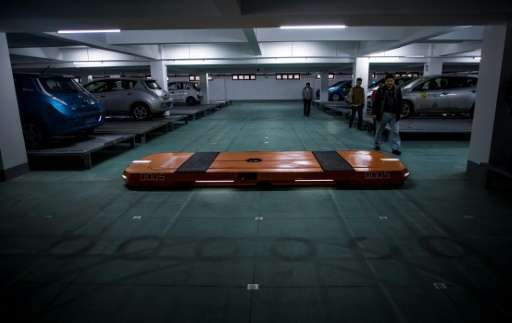 With an eye on the rising numbers of cars on Chinese roads, Hikvision has been testing a robotic parking system in Wuzhen, 130 kilometres (80 miles) west of Shanghai. The working-age population—defined as those from 15 to 59—fell for the first time in decades in 2012, according to official figures, and has declined ever since. It is expected to carry on falling until at least 2030, and economic growth is also slowing. The country is already the world's largest market for the mechanical helpers and it will only get bigger, according to the International Federation of Robots, which estimates China will account for 40 percent of the global industrial robot market by 2019. Chinese appliance giant Midea took over Kuka this year in a deal worth $5 billion, despite protests from German politicians that key technology is being lost to China. Yes, make more robots, then people won't have children because they fear their kids won't get a job or be successful in life, which is highly valued in China and the the human population will be next to zero, however their won't be enough Robotic Technicians to fix the job-taking robots, so everything won't work. Sounds like a brilliant idea.